On the evening of 7th January, in the most remote part of the distillery estate, a number of warehouse roofs dramatically collapsed under the weight, leaving the maturing oak casks exposed to the night sky. In wintery conditions and temperatures of -19?C, distillery staff swung into action, working round the clock to clear the snow. Glenfiddich Malt Master, Brian Kinsman, commented: "Standing amongst the wreckage and exposed casks, we were working out our next steps and assessing the situation. I was thinking about how the casks, some of which were very old, contained some beautiful whisky and it occurred to me that they would create a fantastic non-aged single malt. A limited edition bottling from the whiskies in the damaged warehouses would be an appropriate way of celebrating the pioneering spirit of the distillery team at this moment in Glenfiddich's history. " Nose (89): more than average. malt, vanilla, spices, wood, peaches, floral. Palate (91): smooth, oily, powerful. fruits, malt, wood, spices, honey, vanilla, floral, chocolate. Finish (90): long. fruits, peaches, wood, honey, floral. So based on other whiskies I have already tasted I rate this Glenfiddich Snow Phoenix with 90 points over 100. I haven’t tasted this one. I dunno if it is the same whisky than the 15 years old Cask Strength. It is the same whisky that the previous 18 years old, just that this is the old bottle. Ummm… I didn’t taste this one. Pretty much like the first 15yo on this review, it is the old bottle of Glenfiddich 15yo. 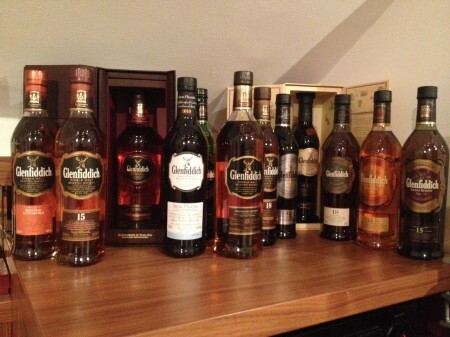 As I said… it is a pity that the bottles are closed and that he doesn’t own the 30 years old. About the whiskies it is so damn hard to choose one… I think bang for the buck I would go for the 15 years old Distillery Reserve or the Snow Phoenix ( with the original RRP ).